I saw this picture as I was checking my backup folder since our HP server died down. It was taken during the visit of the owner of the company, which I am connected, here in Cebu City, Philippines. 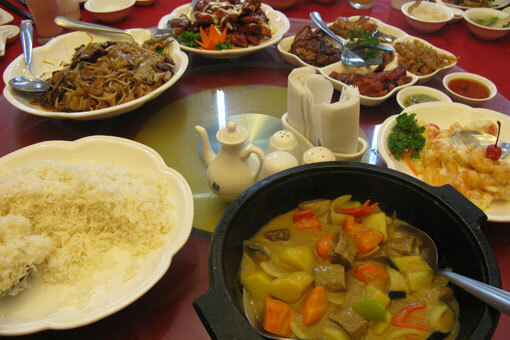 We had our company lunch out at Choi City Seafood Restaurant. It served as a farewell lunch as our boss was scheduled to fly back to California, United States. The other day I brought a local Cebuano food – Paklay for my lunch. It looks yummy and this is one of my favorites. The Paklay (tripe stew) that I brought was made of pork innards – tripe, liver and heart, pork skin, and bamboo shoot. It was sautéed and cooked with ginger and chilies. It also contains strips of green and red bell peppers, and carrots. I thought it was not that hot and spicy and I’d be safe from eating too hot & spicy food without gallbladder. My first few spoons was good and I felt the regular hot and spicy flavor of the Paklay. But during my second serving of rice, I slowly felt that it was very hot and spicy. My colleague even noticed as I often blow some air. As I continue eating, I felt the sweat on my forehead – this is my sign that I eat too hot and spicy food. I finished my meal with cold water. I’m trying to mostly stay away from fatty foods though as I’m sure that wouldn’t help with the gas stuff. I’m hoping that goes away in time as I think it’s still pretty sensitive right now. I usually feel the pain the most when I go for those walks.